gnoc·chi - thick, soft dumplings made traditionally with flour and potato but can also be made with squash, cheese, spinach, etc. We may have been a little over-ambitious in our undertakings (between getting groceries and cooking everything, it took us from about 4pm until almost 9pm). However, everything turned out delicious in the end (although there were a few points in the night where we really questioned how things were going). So here is a recap of our dinner adventures that night. 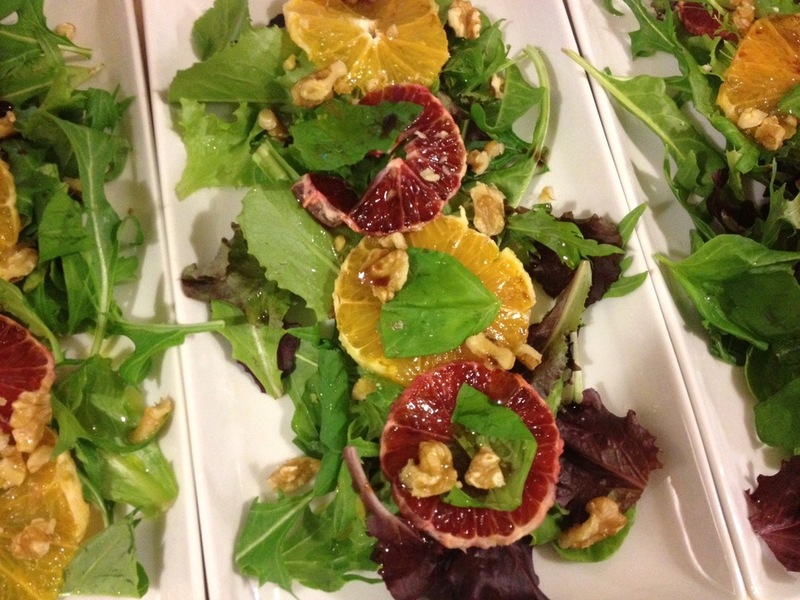 To start I quickly assembled a green salad with oranges (blood and tangelo), walnuts and basil. I drizzled the salad with olive oil and balsamic vinegar. Considering the gnocchi is very filling, the salad was light and refreshing. 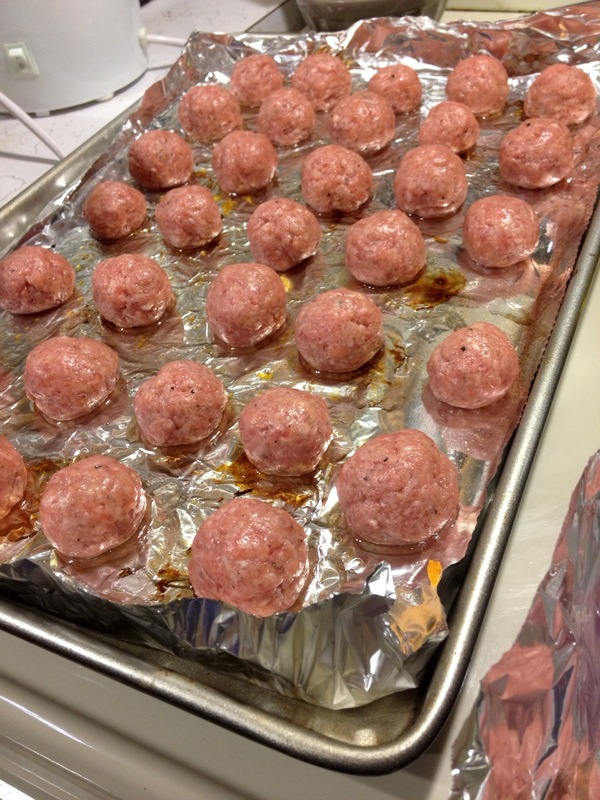 We used this recipe from T’s Tasty Bits for the pork meatballs, kale and sauce. The sauce was a bit too runny for our liking so we added only 1/2 of the required chicken stock. 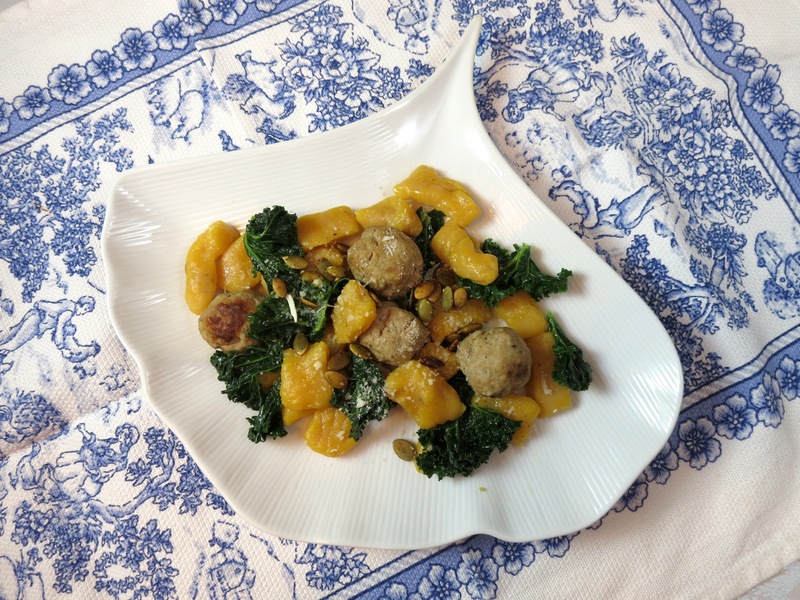 The meatballs were fantastic – adding parmesan and nutmeg really made them flavourful and perfect to pair with gnocchi. For the kale, remember to sprinkle copious amounts of table salt on the leaves and let sit for at least 15 minutes before rinsing – this will get rid of the bitterness which is characteristic of kale. Make sure to rinse off all the salt carefully before cooking as it easily gets in between the curved leaves. Now for the gnocchi… First we roasted our delicious squash – sprinkled with sea salt, pepper and drizzled with olive oil before baking. Then we mashed the squash using a potato masher (we also used a hand held blender to speed up the process). The recipe I had suggested using only 1 cup of flour for a 2lb squash. Thinking that this didn’t sound like it would make enough gnocchi (and I love having leftovers! ), we doubled the recipe. 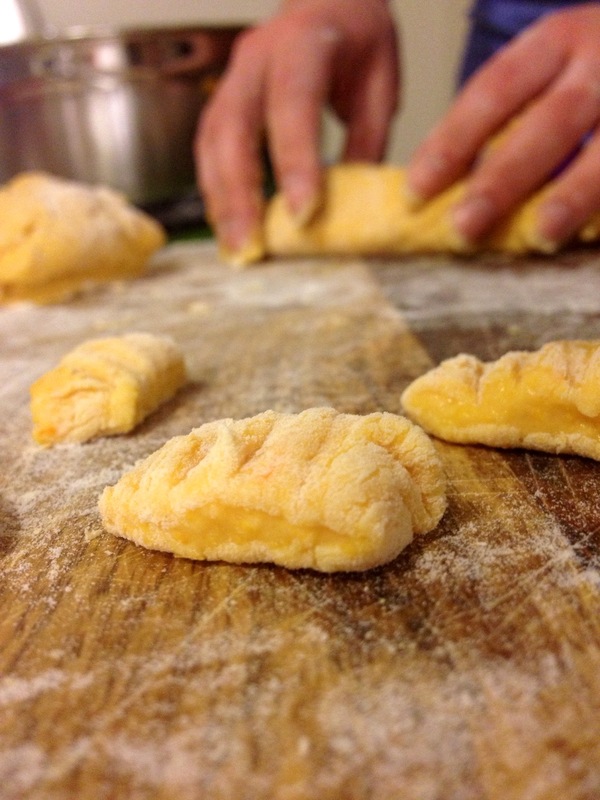 After actually adding the recommended amount of flour, I realized the dough was still much too runny – so runny that there was no hope of possibly rolling the dough into ropes and forming gnocchi with it. After some troubleshooting and frazzled online research, I realized that other recipes suggested using much more flour to make a workable dough. After adjusting the dough by adding more and more flour, I had a workable dough (and probably enough of it to feed the whole block… I was regretting doubling the recipe now…). 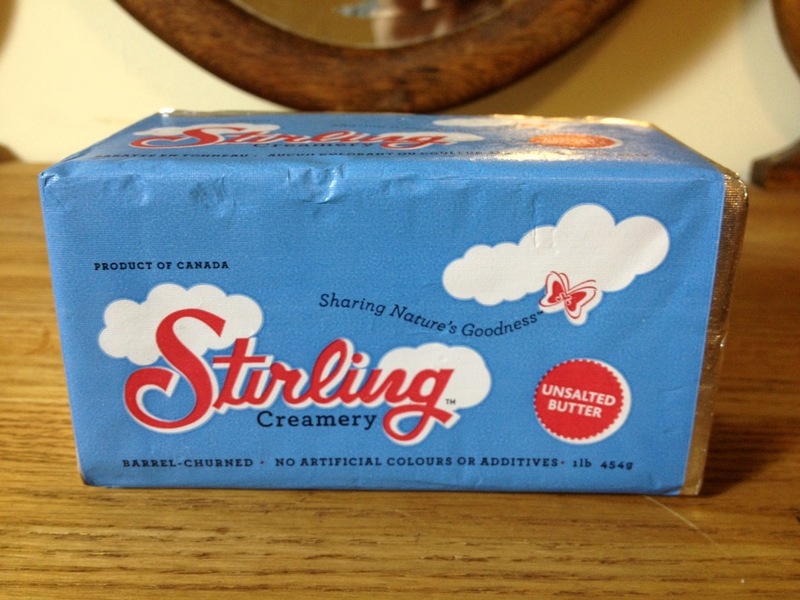 I have posted the approximate ingredient amounts we ended up using below. However, these are just approximations and will vary depending on the size and moisture of your squash. The finished dough will still be quite sticky, will pull away from the bowl when mixing and can be shaped into ropes with generously floured hands and floured surface. The seasonings should also be adjusted to suit your taste. The dough was then divided into smaller sections are rolled into ropes about 2cm thick. Each was cut into small section and pressed down with the tines of a floured fork. We cooked the gnocchi in salted, boiling water. Once the dumplings float to the top in just a few minutes, they are done! 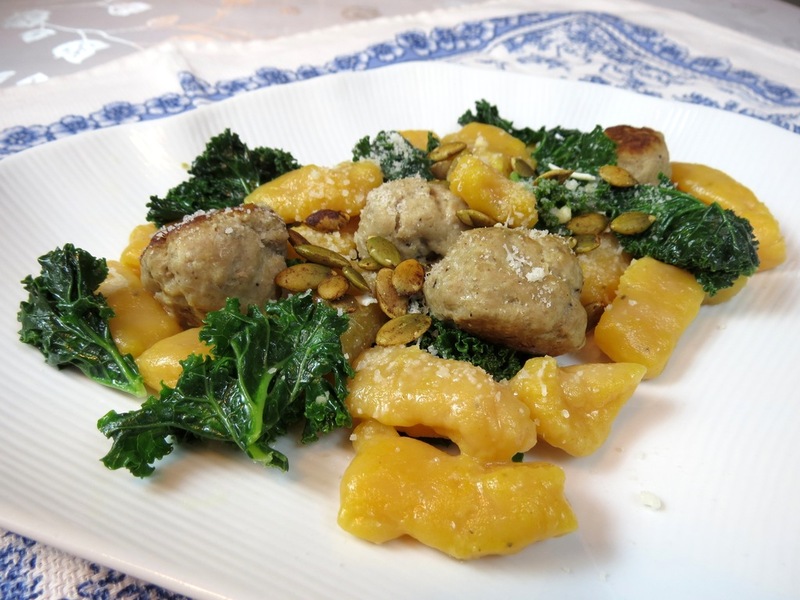 We combined the gnocchi with the sauce, meatballs and kale as per this recipe. We garnished the gnocchi with spiced pumpkin seeds (from Blush Lane Organic Market of course) and freshly grated parmesan cheese. In the end, it was well worth the effort! 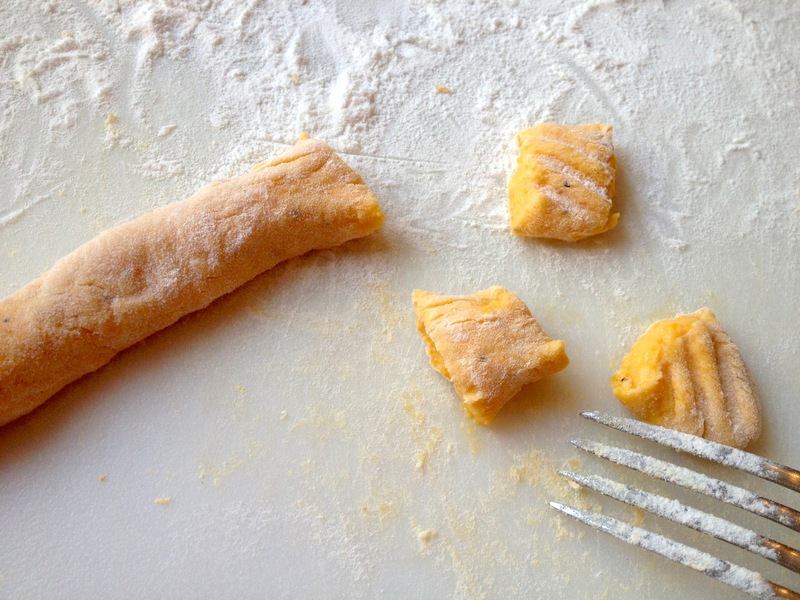 Has anyone else tried making butternut squash gnocchi? What about tradiitonal potatoe gnocchi? Any tips you’d like to share? 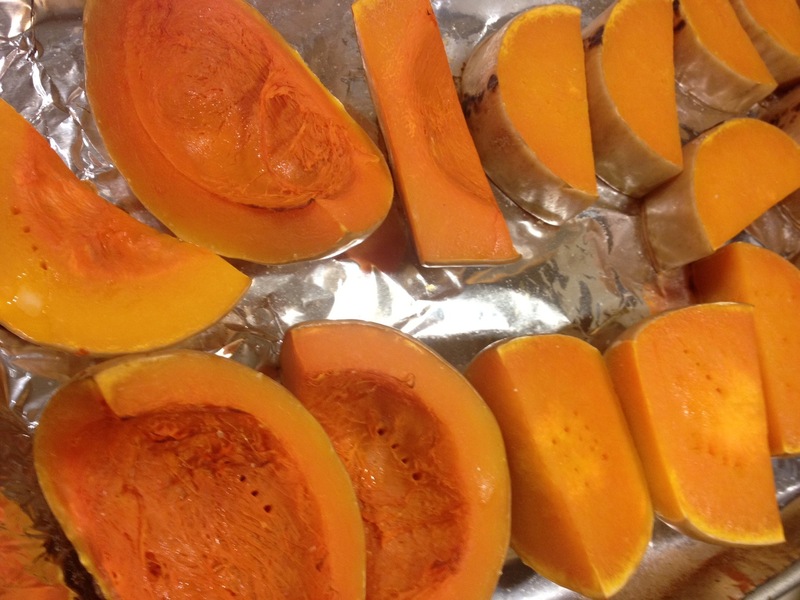 Slice your squash lengthwise, seed, and cut into smaller sections. Roast at 400F until the squash is soft, about 20 - 30 minutes. Remove the squash from the skin, mash until smooth and let cool. Add egg yolks, cheese, nutmeg, salt and pepper to the squash and mix until combined. Next gradually add the flour to the squash - you may need either more or less flour to form a dough of the right consistency. Begin by adding 1 1/2 cups of flour and add about 1/2 cup at a time thereafter. Mix after each addition until combined. The dough is ready when it begins pulling away from the bowl. Butternut squash dough will still be quite sticky when ready - you will need to roll it on a floured surface with floured hands. Divide dough into smaller sections. Use floured hands and a floured surface to roll into ropes, about 2cm thick. Cut each rope into small cushions and use a floured fork to press down each cushion slightly. Cook immediately in boiling water - when the cushions float to the top, they are done. The formed gnocchi can also be easily frozen. Oh my goodness – as always, this looks amazing!!!! My Italian friend would always say… “you must have to put the nutmeg to call the gnocchi, gnocchi.” I find this variation very interesting and will try it when I get a chance!! I’ve made traditional and I enjoy how delicious fresh gnocchi is but if you haven’t tried the pâté choux gnocchi method, YOU MUST(it’s potato/vegetable free. Flour and egg, but made into a choux pastry dough first)!! That sounds delicious! I’ve just made pâté choux for the first time for chocolate eclairs recently and haven’t even heard of pâté choux gnocchi – I will have to try it! Thanks!